Private lessons are designed to enhance group instruction, not replace it. If your schedule makes it difficult to attend our weekend classes, or if you are having difficulty mastering concepts taught in class, spending some one-on-one time with an instructor is a great option. Our instructors are patient, mature professionals who can quickly analyze your technique and help you to master skills. 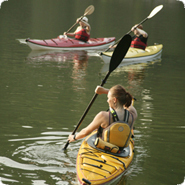 A three-hour lesson is ideal for someone who is new to kayaking or who wants to cover a wide range of skills. Private lessons are available on weekdays. There is a $50 charge if you do not have your own kayak. A two-hour private lesson is an appropriate amount of time for experienced paddlers. Pair up with one of our top instructors and use their trained eye and expertise to help you master those skills that you can't quite seem to get on your own. Private lessons are available on weekdays. There is a $50 charge if you do not have your own kayak. 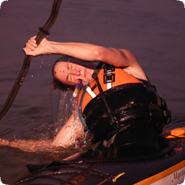 Below are some products that we frequently recom-mend to our beginning sea kayak students. Have a look, and if there's any-thing else you need to make sure you're ready for your sessions on the water, we've got a ton of gear over in our online store! Check it out!